Mac OS X is the world's most advanced operating system, blending the power and stability of UNIX with the legendary simplicity and ease-of-use of the Macintosh. Mac OS X version 10.3 Panther contains over 150 new features and provides significant enhancements to its modern, UNIX-based foundation. Panther includes iChat AV for personal video conferencing, Expose for instantly finding any window, and a new Finder for easy access to everything you need. It's like having an all-new Mac. 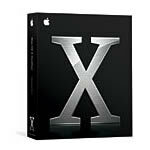 This used Apple Software OS X 10.3 Panther requires Apple OS X 10.2 for installation. In stock and ready to ship.